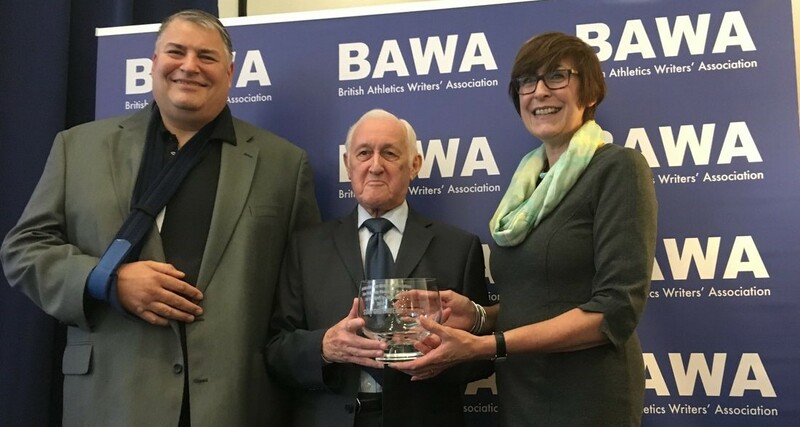 “The recipient of the Ron Pickering Memorial award for Services to Athletics for 2016, is a man who for 26 years sat alongside my father and David Coleman in the BBC commentary boxes around the world, not as a commentator but in the years before computers, Commentator Information Systems and indeed the Internet, was invaluable to the BBC commentary team that was seen as the gold standard around the world: namely The Statistician… Stan Greenberg! Indeed, just for being the buffer between the egos within that commentary team, and perhaps much more than most, and certainly more than he deserved, the target of David Coleman’s wrath, this recipient deserves a bloody medal and not just this award. Stan attended Hackney Downs Grammar School in East London, a school that also nurtured Sir Arthur Gold, BAWA honorary president Mel Watman and, much more recently, high jump star Dalton Grant. Stan was the second fastest sprinter of his year, the quickest being one Harold Pinter while another sprinter, Maurice Micklewhite, was making a name for himself in the Under 12s 100 yards, only later to change it to Michael Caine. Stan attended one day of the 1948 Olympics at Wembley and was hooked on athletics ever since. As a founder member in 1958 of the NUTS (National Union of Track Statisticians) he became known to journalists as one of the prime sources of information and at the end of 1975 his friend Norris McWhirter invited him to become sports editor of the Guinness Book of Records. Meanwhile, his first experience as a TV statistician was in the London studios of ITV for their coverage of the 1964 Olympics in Tokyo and he started with the Beeb in 1968 and for the next 26 years he travelled the world with the team. My father used to tell the story of one of those trips in the late 70s or early 80s, where they travelled to East Germany for a competition in one of the old communist era Stadiums. Before the competition they were shown to the commentary position which happened to be on a tiny gantry high above the stands, open to the elements and pretty much everything else, requiring them all to climb up some flimsy ladder to take their places. Stan was no fan of heights and certainly didn’t enjoy the precarious surroundings with only enough space for Ron and David Coleman alongside the sound engineer and the indispensable Stan. Ladies and gentlemen please put your hands together for the man that was known from that day on as Stan “Chair Chucker” Greenberg”. Stan was very shocked and had no clue that he was receiving this award. It really did mean a great deal to him that he had received this award in Ron’s memory as they had been so close for many years.